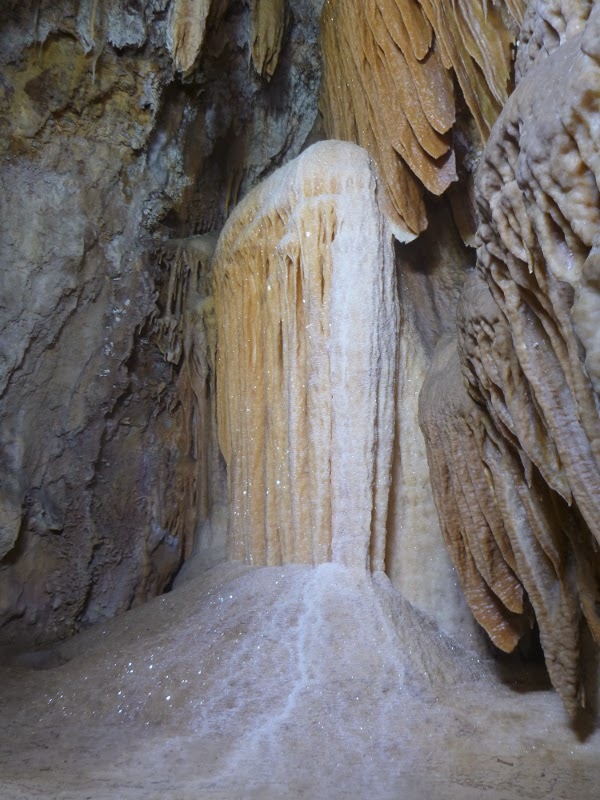 … that is until I was awoken by my alarm telling me to get up – I reluctantly dragged myself out of bed, fine tuned my bags and was soon driving myself and mum to Jenolan. We arrived at around 9ish and in traditional SUSS fashion there were still people asleep. We were eventually under-way; I was going on a easy trip to Hennings and Aladdin with some of the first time cavers and managed to get a lift in the back of Rod’s tray. Rowena was also doing her usual stuff on Lucas rocks. We didn’t have to wait long for the walkers to reach Mammoth Flat and continued up the valley where I learnt of a new entrance into Mammoth called Sand Cave(?). Not too much further along we reached Hennings bluff where we were greeted by the guardian lizards. 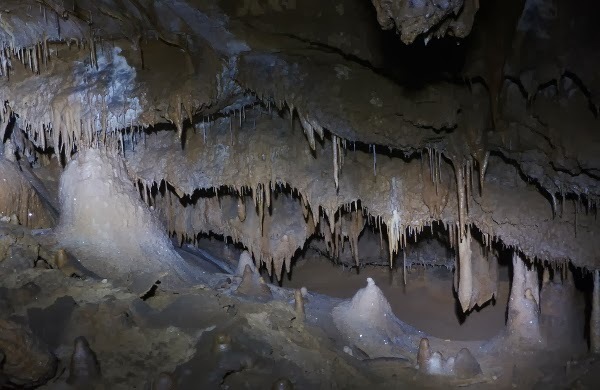 We got in out of the heat, looked at the phallictite, and went over some cave etiquette. Whilst everyone was getting ready I did a small loop though a narrow opening on the right, which entered into a large passage; I took a tube to the left which joined back to the main chamber. 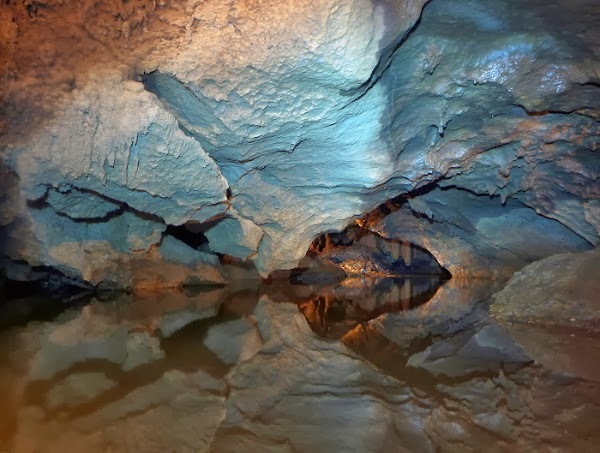 We where soon all ready and went through the same tube and to a pretty section in the northern side of the cave. We attempted to scare the new peoples by pretending to ‘fall’ down a hole. To Allan’s dismay I mistimed the prank. I then went of to the South part of the cave wandering around the left bit where the roots where making their to the cave and the right section which had a climb that seemed to go quite some way. I thought I’d been gone a bit tool long so sped back and met the others at the funnel coming my way. I looked at a lead which got too narrow but seemed promising and then followed the others to where I had come from discovering an alternate way in via another squeeze. I then climbed the the 10m aven discovering some helictites and a pretty room that unfortunately had muddy boot prints over the floor decorations. I climbed back down and almost missed out on the best room of all which the others had just returned from. It was quite impressive and I spent some time photo faffing before following the others out and having a bite to eat. We then headed back down the valley eventually crossing the bridge on the tourist walk and soon after heading up the hill past Rho Hole and to the entrance to Aladdins. This cave was more obviously a tourist cave with ladders and chicken wire enclosures. Before the first ladder I had examined a narrow slot that looked like it might go somewhere interesting – if I could fit! At the bottom of the ladder is a sloping rock with a hand line and another short ladder at the bottom. You can then head left or right into some nicely decorated rooms. We couldn’t spend too much time enjoying the rooms as we needed to return the keys to the office. Once out Thomas returned the key whilst the rest of us headed back to the hut. 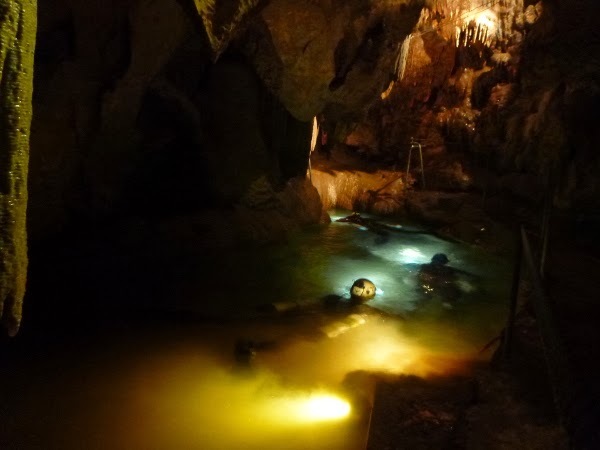 Instead of having a shower and relaxing I headed into Imperial cave to watch the divers. I got a lift down in the tray and helped carry some of the gear. In the meantime I noticed Rod scrutinising the riverbed. It turns out it used to be some sort of wishing well and you could often find old (and new coins). My first find was a shilling(?) which involved me reaching in and getting me wet up to my cheek, the second was for a mere 20cents and a 5cent coin on the way back out. We then went exploring Imperial for a half hour or so. When we returned the divers still weren’t out and I scored $1 and an old penny. The divers emerged quite satisfied and headed out. I discovered a great photo opportunity and despite rushing think it is my favourite photo of the trip. I was the last one to sleep (a first). I slept in the hut for the first time; the beds where much more comfortable than I expected. In the morning Allan gave me some pointers on editing photos and I tried to get some maps of Harry. The three of us headed off quite late, we where originally going to explore (??) but changed plans to accomadate Allan’s injured shoulder. Our alternate plan was to probe the extremities of Hennings hopefully finding something new. We had some interesting conversation and my light failed towards the end of the day. We didn’t have anything interesting to report 😦 It turned out to be quite a short caving day. Back at the hut leftover food was eaten whilst the cleaning commenced. I scored the fabulous chore of mopping the kitchen and bathroom.